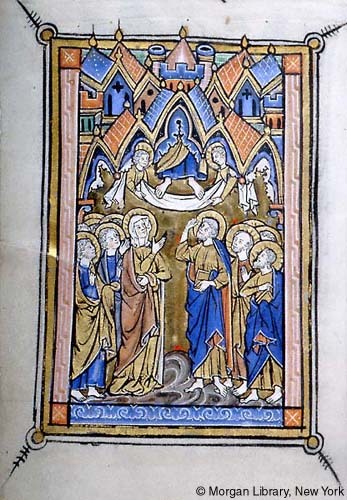 Psalter [and] book of hours. Illuminated manuscript. France, probably Thérouanne, c. 1265 and 15th century. 258 leaves. Provenance: P. Vande Camée. — Morris. — Richard Bennett. — J. Pierpont Morgan. — Morgan Library (MS M.97). References: Additional bibliography (Morgan Library). — Curatorial description (Morgan Library). — de Ricci, 2:1384, no. 97. — Ellis valuation, fol. 5, no. 74 (£100). — Morgan Catalogue 4, no. 28. — Schoenberg (SDBM_MS_14305).